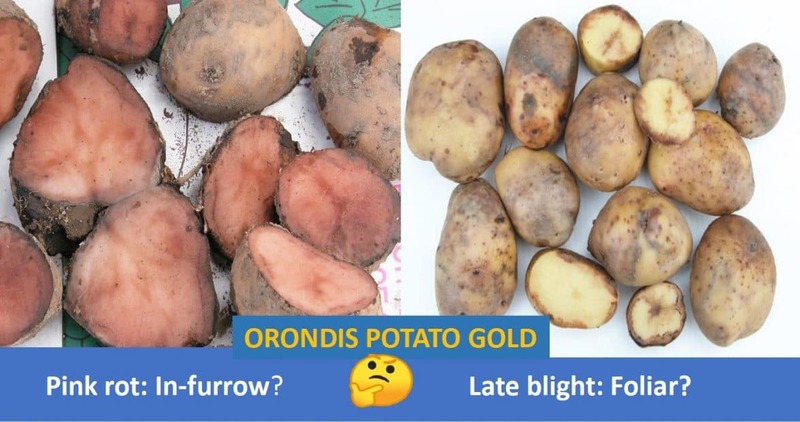 In 2017, a very wet year, potato growers who used Orondis for late blight were very pleased with the performance of this fungicide.This year, potato growers can continue using Orondis for late blight during the season, as long as it has not been applied in-furrow at planting for pink rot control. Most potato varieties are susceptible to either pink rot or leak, but research has shown that some varieties are particularly susceptible to pink rot. These varieties include Russet Norkotah, Dark Red Norland (often used as a susceptible standard), and the red skinned variety NorDonna. If you will grow any of these three varieties in 2019, then Orondis in-furrow is a good choice. The fumigant chloropicrin acts more like a fungicide than a biocide. It has been reported that chloropicrin controls pink rot and Pythium leak. Anecdotical evidence from Alliston, Ont., concurs with published reports: a fresh market grower used to have problems with Pythium leak every year. Since he started fumigating his Superiors with chloropicrin, he has not had problems with leak. If a field has had a history of pink rot, then there is no doubt that Orondis should be applied in-furrow. Potato growers know their fields and varieties very well; common sense allows them to make the right decisions. Thus, the final decision will be up to them.